Ann Smarty gave us an early heads up about Viral Content Buzz (VCB) when it first launched. Now she has let us know that Viral Content Buzz has been rebranded to Viral Content Bee (still VCB). I want to make sure no one missed that VCB allows you to get stumbles, likes, tweets and pins. You can get more traffic, readers, followers and likes. 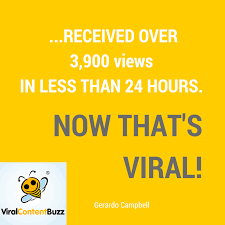 If you want influencers like us to share your content, use Viral Content Buzz (VCB) so we’ll see it. If you’ve used JustRetweet, you already know about how to use VCB. If you combine both, you can get +1s on Google, greatly increase your followers and retweets on Twitter, and get even more likes on Facebook! Why wouldn’t you want to promote your very best content? You really should start using ViralContentBee.com. 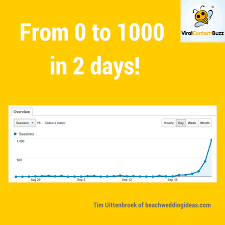 ViralContentBee really works. Because I use it, plus JustRetweet and MavSocial, 2 of the most top posts on AllBusiness in 2016 were mine. You can see their list in The Best Entrepreneurship Advice of the Year. The cure for that is to invite other fashion brands to join. Something else you can do is use Dlvr.it to feed content from relevant other sites to your social accounts so they recognize you and may share for you. Or you can manually do it if you want to be very selective and have the time. I never heard about VCB program, but now it seems that one should go with their strategy to kick start his online project. I spend most of my time in engaging with my readers, and sharing my content across the social networks using JustRetweet, and AddmeFast like services. Just go to Viral Content Buzz and sign up. Then start clicking. You’ll figure it out quickly, and if you don’t you can ask me on Skype (username growmap) or ask questions here. VCB does not have G+ integration yet, but they’re working to get it. You can get +1s using JustRetweet today. That last couple of campaigns I ran there got over 30 +1s each. I recommend using them both for maximum reach. Disclosure: I do paid work for Chris Fong who bought JustRetweet from the original developer and I collaborate regularly with Ann Smarty and Gerald Weber who created Viral Content Buzz. I use both systems because they work and I believe them to be beneficial to bloggers and small business – not because either of them has ever paid me to use them. They don’t. The most important is the content. It really is the foundation for our site. Good content actually helps the reader amused, and will share their spread. The key thing about a social sharing platform is that there is content, sharing options, and a choice on what is shared and what is not shared. Byron Warren would love you to read ..No last blog posts to return. Contests seems to be one of the best methods to get traffic to the blog .I think the main intention of this contest is to get Traffic to the blog that would host the contest . The idea of the Contest is interesting . Would definitely keep an eye on the contest . These tips are not only useful for commentators but also for webmasters/owners . There’s no doubt that commenting and responding to comments are the best ways to build a relationship and engage your audiences . Thanks for sharing this info . Thanks for the share….. Looks like a perfect contest to have good exposure and also may be some money…… Thanks again for sharing it…..
What a wonderful contest to get people exposure for their businesses through web marketing. Thanks for informing us! You’ll definitely want to check this out for increasing social shares on your best content. Big thanks for this entry. Some pretty juicy info out here. Excellent post. I have listen that social media Marketing plays an important role in ranking of your keywords, If you have more social sharing then Google gives you more worth. It is absolutely true that more social sharing helps your content rank better. You can prove this for yourself by resharing an older post. If it gets new shares and comments it can start bringing in traffic again. Does ViralContentBuzz support Google +1’s Gail? I was just on the site, and I don’t see it as an option. Regardless, sounds like an awesome contest and I’m testing the site out to see how it works for me. Not yet, Josh, but they’re working on adding it. JustRetweet does already support it so if you use both you get a different mix of people sharing your content on overlapping social networks.